If I could afford to do so, I’d eat these every day. But my diet has warned me, I’d better not. It all started with a talk on what would go well with Bacon Wrapped Cheese Stuffed Jalapenos. We struggled with what to pair it with. And then we decided turkey sandwiches could possibly make the cut. Wraps were compromised to save a few calories, and vegetables stuffed inside to make it more nutritious – voila, Monster Cheesy Turkey Wraps. Completely worth it by adding cheese and the cream cheese spread we used in the bacon wrapped jalapenos. 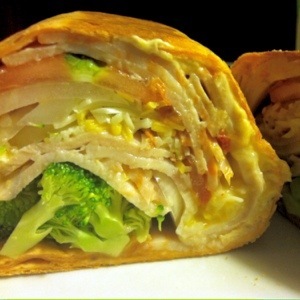 Fill wrap with turkey, cheeses, and vegetables. Roll wrap and place into a hot pan to seal it and warm the wrap. Heat on all sides, rotating after a few minutes on each side. Wrap should be crispy and the insides should be warmed. Cheese melted.